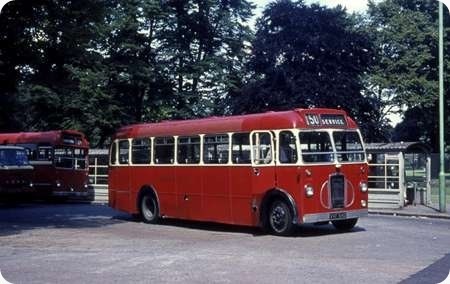 Crosville was one of the main users of the Bristol SC4LK model, with a total of seventy nine examples, of which fifty five were buses and twenty four were coaches, although the latter were soon downgraded to bus status, without being greatly modified. The first batch were new in 1957, numbered SC1 – 16. but in May 1958 they were renumbered SSG 601 – 616. These vehicles were a familiar sight in most of the Company’s Welsh areas, with their small size making them ideal for running along single-track roads. The Gardner 4LK engine resulted in extremely good fuel consumption (over 20mpg) but limited their speed capability. It was often said that they could climb any gradient, but might take all day to do it! After withdrawal, SSG 612 was used as a maintenance vehicle for the Runcorn Busway, numbered G612. This enabled it to be bought for preservation and restored to its present superb condition. In April this year, the bus, now carrying its original number SC12, was used for a Crosville Enthusiasts Club outing, revisiting some of the routes which used to be operated by this type. it is seen here at Cwm Swch, having just left Cwm Penmachno, the terminus of Crosville’s route from Llanrwst and Betws-y-Coed. This route is nowadays covered by Llew Jones using Optare Solos – a very poor comparison, although it can perhaps be said that the Solo is a modern day equivalent of the SC! Nice view, Don, and not just of the bus! Thanks for posting. Here’s a silly question. It’s clearly a full-fronted vehicle which, in most circumstances, would be recorded as ‘FB’ or ‘FC’, so what was it about the SC series that it was felt B or C alone would suffice? By way of comparison, I attach an image from a slide of a standard Bristol MW6G bus SMG 373 taken in the early 1970s on service M3 seen returning to Llanrwst – the driver kindly stopped to permit the photo. At the time the SC and MW types were the regular vehicles on the Llanrwst country routes – those were the days. The Bristol SC series was designed and always built as a full front vehicles, never as a half-cab. Therefore the decision makers in the PSVC decided that a plain B or C would suffice. The same rule is applied to Bedford SB, Ford 570E and Commer Avenger coaches. I don’t think I have ever travelled on an SC4LK. From the descriptions here and elsewhere, I’m glad I didn’t do so in their hey-day, but curiosity today might just make me try one at a running day! The attached photo was taken from the bridge looking to the terminus at Cwm Penmachno again in the early 1970s and again the driver had kindly stopped. The running times in those days were very generous even for an SC and the Llanrwst drivers were always very friendly towards a young English enthusiast riding into deepest Wales. With grateful thanks to them. In answer to Ronnie’s query my 1967 Crosville Company Fleet List shows there were 1,173 buses + coaches plus 15 service vehicles in the fleet in an ’empire’ stretching from Newcastle-under-Lyme in the east to Aberaeron in the west. That’s throughout England and Wales of course, and 32 Depots plus 3 sub-depots (outstations) ranging from 1 vehicle at Barmouth to 123 vehicles at Wrexham. Referring to the Bristol SC4LK I agree with all the comments about them, but nevertheless have a soft spot for them, I suppose because they were such a nostalgic part of my summer holiday bus riding in North Wales. The cacophony of the engine noise and the vibration on a long uphill gradient such as ascending the Crimea Pass could likely induce a nosebleed in those susceptible, and combined with the competing din of twenty-odd housewives chattering in Welsh on a returning market day service from Llanrwst to Blaenau Ffestiniog would ensure your ears not just popping but actually ringing for ages after you hurriedly made your exit in Duffwys Square! That was the R34 service from Blaenau Ffestiniog to Llanrwst taking all of 1 hour and 10 minutes. I think the reason why the smaller vehicle was chosen in preference to an MW was that between Betws-y-Coed and Llanrwst, unlike any of the other services linking those towns, it operated down the western side of the Conway Valley, i.e. via Cwmlanerch and then had a tight turn onto the river bridge at Llanrwst. It operated two return journeys from Blaenau Ffestiniog throughout the year, although I should think that it was occasionally suspended in winter when snow afflicted the Crimea Pass! Those two journeys were denoted in the timetable by L, indicating Llanrwst Market and Fair Day. It then helpfully mentioned that Lanrwst M.D. was Tuesda , but would not operate in the week of Fair Day (Wednesday following the first Tuesday of the month) when it would operate on the Wednesday instead! Such operational trivia used to be common in rural area timetables all over Britain. In North Wales other Market Day/Fair Day footnotes were necessary for Denbigh and Ruthin. To digress a little I used to live near Lancaster and the Ribble timetable for service 79/80 between Lancaster and Knott End on Sea had amongst the various codes the footnote: ‘On the occasions when the tide renders the direct route between Conder Green and Glasson Dock impassable, the route will be diverted via Upper Thurnham’. Today, a ‘dyke’ has been constructed making such interesting diversions away from the cold muddy River Lune estuary well and truly a thing of the past. The subject of Dan’s article SSG 612 was perhaps in Dan’s photo of the late 50’s, allocated to Llanrwst. In 1967 it had migrated to Pwllheli, or Porthmadoc outstation, maybe for the Borth-y-Gest /Morfa Bychan service. 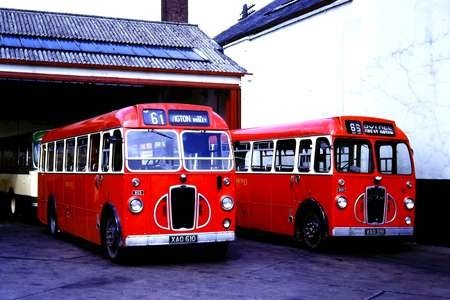 SSG 612 and sister SSG 613 were eventually preserved,even appearing on Crosville Wales heritage services in the mid 90’s. Perhaps someone else will be able to continue that story. Thanks David for the garage allocation. My sister lived in Wales for much of the 1960s, in various locations between Barmouth and Harlech and I had a vague memory of seeing a Bristol SC in Barmouth. The allocation list shows a couple at Dolgellau, so no doubt I will have seen them –and ridden on them – on the S34 service between the two towns. I reckon all enthusiasts will have some regret about disposing of items many years ago which they wish they had kept. Mine would have to be a complete set of Crosville timetables, five volumes I think, from the late 1960s. I would give my right arm to still have them. 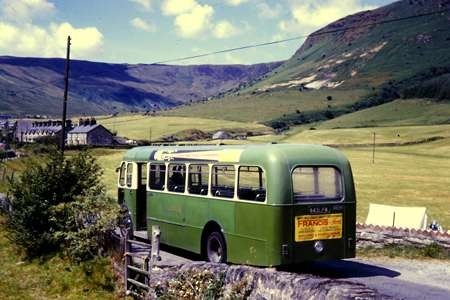 There must be dozens and dozens of small Welsh villages which no longer have a bus service and it would be fascinating to read them. To conclude the small gallery of Crosville Bristol SC buses I am attaching two more photos of SC12. This was used in the 1990s along with SC13 on various vintage services by Crosville. 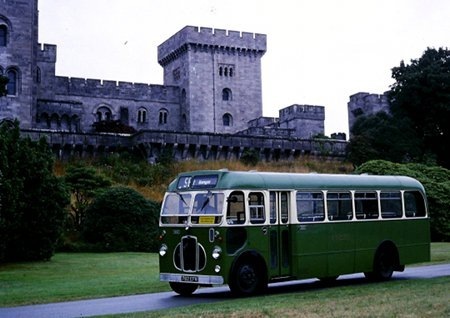 It is seen on the service based at Bangor which linked the town with both Beaumaris on Anglesey and Penrhyn Castle which is owned/managed by the National Trust. 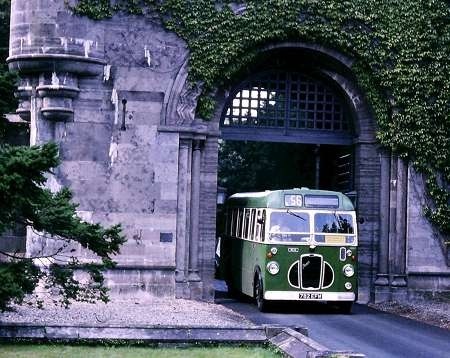 As far as I am aware this was the first time a bus service had entered the grounds of the castle. SC12 was renovated at Crosville Motor Services Sealand road central repairs in Chester in the early 80s. I was an apprentice who along with others worked on the bus. As it was being completed Enigmas Film Productions hired the bus for a Chanel Four film directed by David Putnam. The film was called “Experience Preferred but not Essential” (look it up on you tube and you will see the film). My dad Eric Manley was a driving instructor at the time at Crosville and was the driver in the film. The film was based in Phylleli North Wales in the 60s however it was filmed in Douglass Isle of Mann as in the 80s Phylleli was not as it was in the 60s. I have the only fully restored red and cream Bristol SC4LK! It is ex Eastern Counties LC 556 (3003 AH). It was new to ECOC in Jan 1959 and served the company for 11 years. Following withdrawal in 1970, it passed via Ben Jordan, the famous Norfolk bus dealer, to Monk Contractors of Warrington as a staff bus. From there it passed to dealer, Martins of Middlewich, who sold the bus on to the Archbishop Sancroft RC High School in Stoke on Trent, where it served as a school bus until 1983. Whilst there, it made the long journey to Brittany in North East France, taking pupils of the school on a field trip. Upon withdrawal by the school, the bus passed to an Oxford bus enthusiast for preservation, but sadly the owner became ill and the bus sat in his garden for a number of years under trees where it slowly adopted an all over green livery! When the enthusiast passed away, his widow sold the bus to Ward Jones, a motor dealer and enthusiast in High Wycombe, together with an Eastern National example (608 JPU) which the Oxford enthusiast also had in his garden. I discovered the bus ‘through the grapevine’ in the summer of 1993 and made an offer for it, which involved salvaging usable parts from the Eastern National one to make the Eastern Counties one complete. 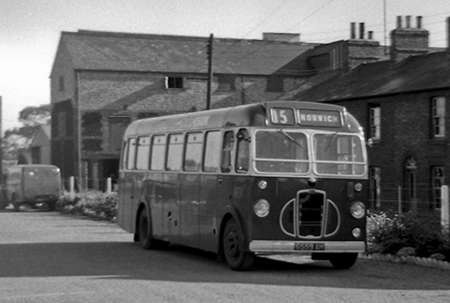 The bus was then towed all the way back to her old operating territory and stored on a farm in south Norfolk. Serious preservation then got underway over the next eleven or so years and the restoration was finally completed in Summer 2005. This was my third preservation project, the other two being LM 452 (3014 AH) 1978-84 and LL 711 (KNG 711) 1984-88, both ex Eastern Counties and a 1958 MW5G and a 1950 L5G respectively. Like Patrick’s other vehicles, this is a superb restoration. It is one of only two SCs that I have ridden on, the other being an Eastern Counties one which was working a crew operated Norwich City service in 1973 at a time of extreme vehicle shortage. Fascinating Patrick, and a creditable restoration. If you have one, could you post a ‘before’ photo? I used to travel to and from school between Ely and Soham on this type of bus (1960)…maybe even this one, if it ever worked from Ely depot.It would have been nearly new then…Years later, and I found myself driving one or two of them at Cambridge, just before they were withdrawn (1970). They were very noisy…lots of rattles…and that awful gearbox, plus having to turn to the left and issue tickets to passengers boarding behind you. They were referred to by all as LC’s. However, 3003 AH looks really well restored, and the picture brings back happy memories of my time at Hill’s Rd depot, Cambridge. I only drove an SC (ECOC LC) for a short movement when I was area engineer at ECOC, but the drivers used to tell me that it was the (David Brown off the shelf) gearbox ratios that caused most difficulty with a large ratio jump between 2 and 3 or was it 3 and 4 and hence the need to run the engine to high revs before the up change. Incidentally I saw the prototype SC in service with BT&CC (or was it BOC by then?) – after which they no doubt decided it was not for them. Bristol territory is hilly and I think only one back axle ratio was available for the SC. All Bristol’s Bristol buses had the lowest axle ratio available compared to other operators (In the K, L and MW days it was 6:1 rather than the 5.5:1 – didn’t do much for top speed until the 5th gear appeared on KSWs). I attach a photo of LC566 – the only one with an all fibreglass body (no panel strapping!) parked at Melton Constable in Autumn 1968 on Service 401 one of the earliest rail-replacement routes that replaced the Gt Yarmouth – Kings Lynn railway. Responding to Geoff Pullin’s note on the SC, I think the big jump is between 2nd and 3rd. Top speed in 2nd is 15mph, but in 3rd at 15mph the engine struggles. 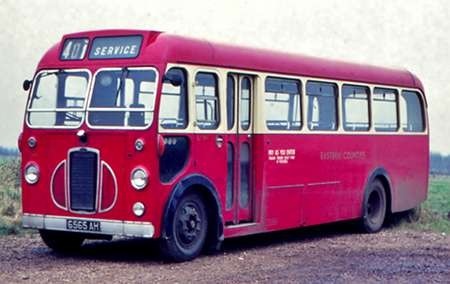 My own reminiscences of the SC as a Bristolian are that I had never even seen one until the opening of the Severn Bridge after which I used to regularly go to such places as the Forest of Dean and Abergavenny where Red & White operated a total of 7. The cab interior is strange, particularly the partition at the rear of the cab and despite seeing them on the road quite a few times in the late 1960’s I don’t think I realised quite what the inside looked like until seeing interior shots on t’internet. 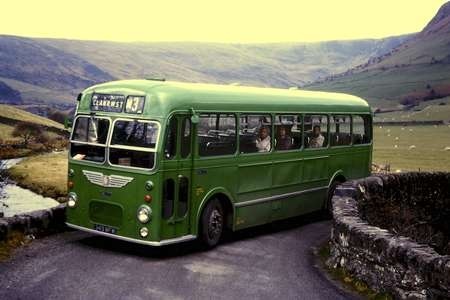 There was a second fibreglass bodied SC, a "self-coloured" green one for Crosville, 237 SFM, fleet No. SSG 664. Lincolnshire RCC had quite a lot. Fine on the flat lands of South Holland, but contrary to popular opinion, Lincolnshire isn’t ALL flat. I remember travelling on an SC one dark damp Sunday evening about 1959, route 3 from Cleethorpes to Lincoln, and it made heavy weather, very slow and noisy, with lots of 2nd gear, over the Wolds section between Ravendale, Binbrook and Tealby. This is a photograph I took on board Patrick’s SC at the Old Buckenham Rally in August 2015. Patrick is at the wheel. 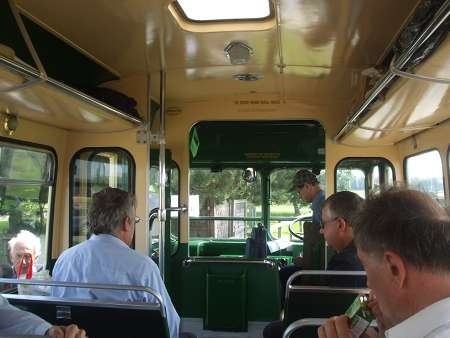 I had never ever ridden on one of the type before. I drove the SC type for Tillingbourne – 2 ex ECOC (TVF 537 & 6560 AH) and 1 ex Crosville (790 EFM) – quite often, usually on the hilly Guildford – Peaslake route that had to surmount the North Downs between Merrow and Shere. The gear positions from the left were: forward for reverse gear, back for first, over and forward again in the central gate for second, back for third, then over to the right and back again in a ‘U’ movement for fourth, and forward from there to engage fifth. One normally started off in 2nd gear, but the detent spring protecting the left hand gate was pretty weak and one had to be careful that reverse wasn’t engaged in error. As I recall, the gap in ratios was between 3rd and 4th, and 5th was a feasible option only on the level and downhill. The SC was an idiosyncratic little machine, and keeping time with it was a challenge, but it was a decent enough little bus and I quite enjoyed driving the type. Yes, it was quite noisy, but nowhere near as raucous as the ear splitting Seddon Pennine IV. Those 3.8 litre 4LK engines were tough little workhorses. It may be that the ECOC ones had cream ceiling and upper interior sides. The Red & White ones had Rexine on the insides of the window pillars and luggage racks of a colour which might be charitably described as mushroom or uncharitably as sludge. I can only assume the idea was that it would not show cigarette smoke staining as it was pretty much smoke-stain colour in the first place. (I can post a picture to illustrate the colour if anyone is interested). Ceilings were (?broken) white when they started apparently. I remember these colours also as being applied in similar places to the BOC MW saloons of the same period. Before researching the facts about the Bristol SC for this caption, I had somehow presumed that Crosville would have been the largest customer for the type. In fact I was surprised to find that they were only the third largest, having bought a total of 79. 323 were built altogether between 1954 and 1961, being supplied to nine BTC operators. Lincolnshire Road Car had the most with an amazing 113, and Eastern Counties was in second place having bought 88. One of the latter’s examples is shown here preparing to depart the former Drummer Street Bus Station in Cambridge on 11th July 1970. LC540 (VVF 540) was an SC4LK with E.C.W. B35F body, new in 1957 and withdrawn in 1971. Memories of childhood visits to Skeggie, Ingoldmills and Cleethorpes. I think they were pretty little rural buses – but the puny 4 cylinder engines did nothing for me. Geographically, United must have been one of the biggest of the Tilling group companies, and I imagine the fleet went well into four figures. Several rural depots would only have two or three vehicles, but I don’t ever remember seeing one of this type in the Newcastle area. But that’s not to say they didn’t have any, can anyone enlighten us? As David says, the SC’s were bonny looking little buses, but their looks betrayed the reality ! Despite serving many and widespread rural areas United sensibly stayed well clear of the model – imagine an SC with a full load of happy holidaymakers climbing Lythe Bank out of Sandsend. They wouldn’t have been so happy for long, nor been able to hold much of a conversation ! Another trip to the best served destination in East Anglia, the mythical town of SERVICE! I recall trying one of Lincolnshire Road Car’s SC4LKs on the town service during my time working in Goole between 1966 and 1969. It is a long time ago now but I remember thinking they did not bear comparison with the "proper" buses I had become used to in Sheffield! 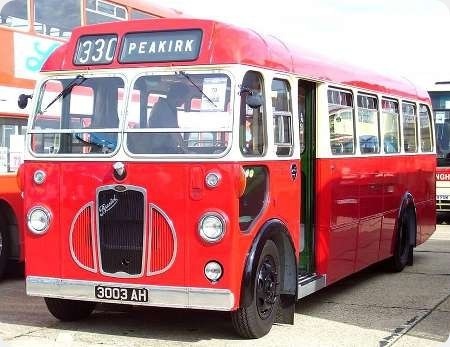 "Service" may well have been the best served destination in East Anglia but "Duplicate" was equally well served in Crosville’s bailiwick during the 1950s – and often without a route number! Whilst on the subject of "helpful" destinations. Can anyone enlighten me on the difference between "Reserved", "Special" and "Private", all three of which appeared together on the blinds of many North West municipality vehicles. I can see reasons for each but a vehicle reserved for a special trip for a private party would probably cause some head scratching for the crew as to which blind to set! I don’t think I’ve ever before seen a picture of one of these buses in red and cream, and they appear even prettier when dressed thus. This is no reflection of course on their many sisters who seemed to prefer green frocks. I have many happy memories of rides on SC4LK’s, mostly with Crosville, but also Cumberland, Vaggs of Knockin Heath and Silver Star of Caernarfon. They were incredibly characterful, with enjoyable sounds and at times a lively performance, although they struggled on hills. The only down side was the lack of forward vision, with partitions and handrails round the forward entrance. 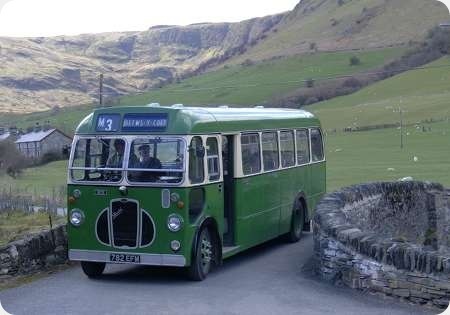 United didn’t have any SC’s, but if they had it is unlikely that they would have been used to climb Lythe Bank the SC4LK was a "niche model" used on minor, lightly loaded rural routes, usually on narrow lanes. The SC4LK was reputed to do 20 – 25 mpg in service. This is probably the main reason they were so popular among the North Wales independent operators. Apart from the 88 which went to Eastern Counties, only 15 SCs were built for "red" operators. So just under a third of the total built were red. Three Eastern Counties SCs are preserved, but the other 17 known survivors are all green. Thanks Geoff, I’ve never actually travelled on one of these buses and would like to do so sometime – maybe I’ll come across one at a rally, and red or green wouldn’t matter for a "test ride." …..but at least they were lighter, and therefore better, than the other Eastern Counties specials; 4LW powered Ls, let alone the LS4LW! Don’t think I ever rode on one. Of course, the SC was the only Bristol type never to have been operated by Bristol Tramways/Omnibus! They were quite adequate for many parts of Lincolnshire, where gradients are unknown, and spot-heights on old ordnance survey maps only occasionally rose to the dizzy height of 20 feet above sea level! Lincolnshire RCC had a network of rather infrequent routes serving these fenlands, where, no doubt, they served adequately and economically. 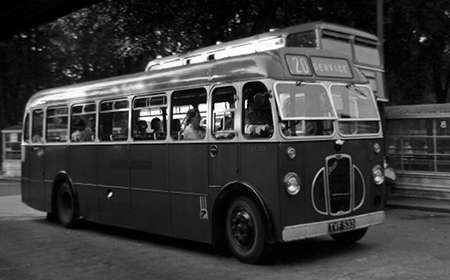 However I remember encountering one on a Winter Sunday evening about 1958, on route 3 from Cleethorpes to Lincoln. This service crossed the ridge of the Lincolnshire wolds, and in the region of Binbrook where there were gradients as steep as 1 in 6. The almost full SC4LK made very heavy weather of it – walking pace, and a deafening scream in first gear. "SORRY – NOT IN SERVICE". A lady passenger once complaining to me about the lack of service said she was going to move there, as all the buses seemed to go to it. Was it the SC that was known as the Tilling Bedford? The niche in the market and engine output were similar to the SB but, more to the point, the axles were supplied by Bedford. The bus in this photo should be showing "WATERBEACH" for service 150, from Drummer St., it travelled along Newmarket Rd., and via Clayhithe. I used to ride home on these vehicles from school at Soham to Ely service 116, and only nine years later I was driving them. They were OK in the fens, but I didn’t like them as they were noisy and rattled a lot, plus having to twist round in one’s seat to issue tickets. The gear positions were different as well and it was a real disappointment to get one allocated for a duty, usually as a replacement bus after a breakdown. The figures in the caption are interesting; 323 built of which a total of 280 were purchased by the three mentioned companies, only leaving 43 for the rest! In the 1960s my sister lived in various locations in the Barmouth area and I’m fairly sure I will have had one or two trips on these. From recollection the services north of Barmouth were in the hands of firstly Bristol Ks and later a Lodekka (for many years DLB 911) but an SC could sometimes be found on the S34 to Dolgellau. Ever plagued by if-only-osis, I can’t help wishing that Gardner had been able to offer a 4LK with an extra half inch on the bores, ie 4.25" instead of 3.75", which would have boosted the capacity from 3.8 to nearly 4.9 litres. The extra torque would have improved acceleration and hill-climbing enormously, and with the engine running at lower revs for much of the time things would have been quieter too. The SC4LK’s excellent fuel consumption probably wouldn’t have suffered either. Even more exciting: there’s a YouTube of a turbo-charged 4LK (definitely NOT a Gardner option) in some vehicle or other. Considering the difficulty of fitting an off-the-peg turbocharger to any engine not designed to take one, it would be interesting to hear how this owner’s engine fares over the long term. All that aside, an "official" 4LKTC would have transformed the Bristol SC. Was the steering as nice as on heavyweight Bristols, or did it all feel a bit Bedfordish? I seem to remember that SC’s, which we all referred to as LC’s, were not at all heavy to drive, certainly not when compared with MW’s (to us LM’s). I have driven a few Bedford Coaches (again, to us CB’s), and I think they were heavier. I didn’t like the thinness of the steering wheels on the early Bedfords (same as the TK lorry) and much preferred a nice fat wheel that one can haul round on a slow corner much more comfortably, especially if there is no power steering fitted. Another thing about the SC’s was that they were very draughty in the winter and you really would need an overcoat!!! Here are two more photos of Eastern Counties Bristol SC4LKs. TVF 533 (ECOC LC533) is seen in Cambridge, Drummer Street Bus Station on 26 August 1959 on yet another timetabled journey to the intensely bussed destination of "Service". It is, in fact, on one of the rural routes out towards Ely. This bus was delivered to the operator in January 1957. 6559 AH (LC 559), dating from September 1959, is pictured (if my recollections are correct) near RAF Watton in August 1960. Remarkably, it is displaying its correct destination ‘Norwich’. Much of the old Watton airfield has now been obliterated by new housing development. Tillingbourne had three SCs in 1971, two of which (TVF 537 and 6560 AH) began life with ECOC, whilst the third (790 EFM) came from Crosville. As other contributors have pointed out, the David Brown gearbox had a curious selector sequence. R/1/2&3 were in the logical positions popularised by the AEC Reliance, with R&1 protected by a detente spring from accidental engagement. Sadly, this spring became very weak over time, and one had to watch out not to pull away in reverse rather than second gear. From third gear, the stick had to be manoeuvred in an inverted ‘U’ fashion back again to engage fourth, and fifth lay immediately forward of fourth. The Tillingbourne SCs were often used on the hilly Guildford – Peaslake service which included a long climb up the scarp face of the North Downs from Shere to Newlands Corner, and, in the opposite direction, the lengthy drag up the dip slope from Merrow to Newlands Corner. This topography was very different from the flat lands of East Anglia and Lincolnshire, though the Crosville examples would probably have met some hills in their lives. The 3.8 litre Gardner 4LK developed 57 bhp at 2100 rpm, and it certainly spent much of its life at those revs in the SC, with deleterious effects upon one’s hearing. Later production 4LKs were rated at 60 bhp, though I cannot believe that this would have made any material difference. The gaps between the gears meant that the engine had to be taken to high revs to change up, but, on the rare occasions when fifth could be engaged (downhill or with a following wind on the flat) this little bus could fly. The 4LK certainly had to work hard in the SC, but its reputation for reliability was always exemplary. I believe that only the axles for the SC were sourced from Bedford. As far as I can now recall, the steering was entirely positive in action. By the time I started working for E.C.O.C. in 1970, the Bristol SC’s were on their last legs, and we were enjoying the comparative luxury of driving RLE’s etc.. although a town duty was almost always a Bristol LKH or LKD/LFS; the North Arbury route (130) was allocated the more powerful 6cyl FLF’s with more seats available. The LKH’s were withdrawn around 1971 I think…such a long time ago! A very nice photo of TVF 533 leaving Drummer Street, Cambridge. It’s correct destination should read— 120 Gt Eversden, travelling through Grantchester and Barton which is to the south west of the city. Thanks for your correction about route 120, Norman. I was working from memory (a decidedly risky procedure at my time of life) and did not check my recollections with Paul Carter’s comprehensive volume "Cambridge 2". The suggestion made by Ian Thompson of a 4LK with the increased 4¼ bore of the LW is, in fact, more than a pipedream. Latil in France were Gardner agents, and they did make such an engine, which proved to be powerful and reliable. Quite what became of the project later is lost in the mists of time, but one can imagine the response of the somewhat megalomaniac Hugh Gardner towards an engine that he could not claim as his own entire creation. Can "Cambridge 2" still be obtained Roger?…and is it a book about Cambridge in general, or about the city buses…If so, I would very much like to own a copy. Norman, There are two books on this subject by Paul Carter. ‘Cambridge 1’ covers the period up to around 1950, and ‘Cambridge 2’ from that time up to deregulation. They are published by Venture Publications of 128 Pike’s Lane, Glossop, Derbyshire SK13 8EH (tel. 01457 861508) who should be able to help you find copies. This publisher does not have a web page. Paul Carter has also written a comprehensive history of Premier Travel. Venture Publications may not have a website, but the associated MDS Books at the same address has a very extensive one at www.mdsbooks.co.uk Presently both Venture’s ‘Cambridge 1’ and ‘Cambridge 2’ are on special offer at £8 each. The Cambridge 2 book is currently available as a clearance item at reduced price in the Ian Allan bookshop in Manchester, or at least it was on Friday. Thank you all very much…I have now ordered a copy of Cambridge 2, as it covers the time I worked for Eastern Counties,…very much looking forward to it’s arrival. Norman: many thanks for your comments on the steering, and I agree all the way about steering wheels and controls in general: a decently-equipped cab inspires confidence. I’ve never driven an SC or an SU, but the very look of the controls on both suggests that what lies beneath is also solidly made. At Warminster yesterday (Sun 13 Oct) I thoroughly enjoyed a ride on 270 KTA, a lively ex-Western National coach-seated SUL4A, driven with great verve and understanding, but that little engine makes no secret of the hard work it has to do. Congratulations and thanks, by the way, to everyone responsible for the Warminster event, especially on such a soggy day. Roger: I was so interested to hear from you that my fictitious bored-out 4LK had actually been tried that I found a "moteurs Latil" site that lists (almost) all the engines fitted to Latil timber tractors. It seems that the company was a great user of the 4LW (as Unipower was for similar work in Britain) and later also of the 6LW. I couldn’t find the doctored 4LK in question, but I did discover a tractor model H12 of 1949 with a 9.3-litre engine of 114mm (4.488") bore and 6" stroke, which must surely have been a modified 6LW—otherwise why the imperial-dimensioned stroke? They also did a model M14 between 1949 and 1955, which had a PETROL version of the 4LW! I realise that I’m way off the bus route, but I greatly enjoyed Chris Y’s Onibury/Stokesay diversion and all those other fascinating spin-offs that have appeared on OBP, just as the background in old photos is often no less interesting than the subject. Ian, with regard to Roger’s comments, the French Latil and Bernard concerns built Gardner engines under licence, paying royalties to Gardner in the process. Both vehicle builders increased the bore size (and in some cases the rpm) of the Gardners in pursuit of more power, and Latil carried out this modification on ‘le 4LK’ as well as ‘les 4LW et 6LW’ engines. This could explain the 114mm (4.488") bore and 9.3 litres capacity you mentioned, which I presume would have been a Latil modification of the 6LW design. What the top brass at Patricroft thought of this can only be imagined, but no doubt ‘Mr Hugh’ may well have thrown his hands up in the air, spun around three times and locked himself in the nearest cupboard. Thanks for the information about Gardner Roger. I have always had the utmost respect for Gardner products, but must admit they did, as you say, have an external oiliness about them in certain areas. The castings were of excellent quality, but many of us couldn’t understand why joints/gaskets were fitted to some components and not others. Sumps for example did not have gaskets, and tended to be one of the areas prone to oiliness. At West Yorkshire, engineering staff used jointing compounds which usually did the trick. In the main we used Good Year gasket shellac (which was a rich brown colour and smelled pleasantly sweet) or ‘Hylomar’ jointing compound (apparently formulated for Rolls-Royce. This was dark blue and didn’t smell as nice!) Quite why Gardner did not fit even simple cardboard sump joints in the first place is a good question, but I’m sure Hugh Gardner would have given an equally good answer…. They were still fine engines though and no mistake. I remember the SC’S well as a few for Eastern Counties ran around the Yarmouth area during the 60’s and one in particular LC553 a resident at Yarmouth Depot for a number of years.They operated to my knowledge the 6A to Martham, with a few journeys to Hickling, Stalham and Thurne (village no longer served at all by any Company). Also the 19A to Belton, Haddiscoe and Loddon and probably other lightly loaded routes. Only managed to catch one once. Felt sorry for the driver who had to twist round in his seat every stop to collect fares. One example preserved by the Eastern Transport Collection near Norwich. ECOC also operated a small number of 33str coach versions of the LC (LSC). In 1968 I bought WAH 875 (LSC 875) from Victoria Coaches, S’end for use in the Bickers of Coddenham fleet. It gave several years of good service. Ipswich Transport Society used it for the last day of Bradford trolleys. Flat out from Ipswich up the A1 overnight – filled up in Bradford with 7 gals! Axles were Austin / BMC, not Bedford. I well remember the SC4LK operating for a while when I went up to Cambridge as my girlfriend at the time was at Girton College and if I felt lazy or drank too much the 129 route proved useful in getting back to my digs in central Cambridge, I used to love these vehicles and eventually made a model of the bus from an Anbrico white metal kit which I still have in my model bus collection! Oh those really were the days! A reminder that Cumberland also had some SC buses for use on lightly loaded country services. Taken in 1970 I think the location is Carlisle – I know I was about to board 202 for a scenic ride to somewhere but I no longer have any maps for the area. Tillingbourne of Chilworth bought this former Eastern Counties SC4LK of 1959, 6560 AH, former fleet number LC 560, in February 1971 and it is seen here ascending the bottom of Guildford High Street on Saturday 29 May 1971 en route to Warren Road. I drove this bus several times myself over the taxing route across the North Downs (at high decibels) to Peaslake until its disposal to Sykes (dealer) at Barnsley after May 1972. There is no further record of it being used as a psv, and by February 1974 it appears to have been sold to another dealer, Carlton, for scrap. Roger; I can’t remember any buses climbing the High St other than the short length up as far as Quarry St before turning right towards Shalford. But that wouldn’t lead towards Warren Rd. I suspect that this has just turned right out of Farnham Rd bus station and will then turn right again before going round the loop to Bridge St- Onslow St and North St, in order to get to the top of the town. John, yes, you are right. The Old Town Bridge is behind the bus in the right hand top corner. I was (totally unaccountably – my wife comes from Guildford) thinking of the Farley Green route that that I often worked on Saturdays; this did follow High Street/Quarry Street on the way to Shalford. 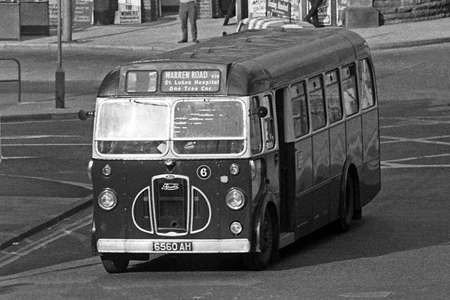 The Warren Road service lasted only a few months longer after this picture was taken as it was withdrawn on 16 October 1971.